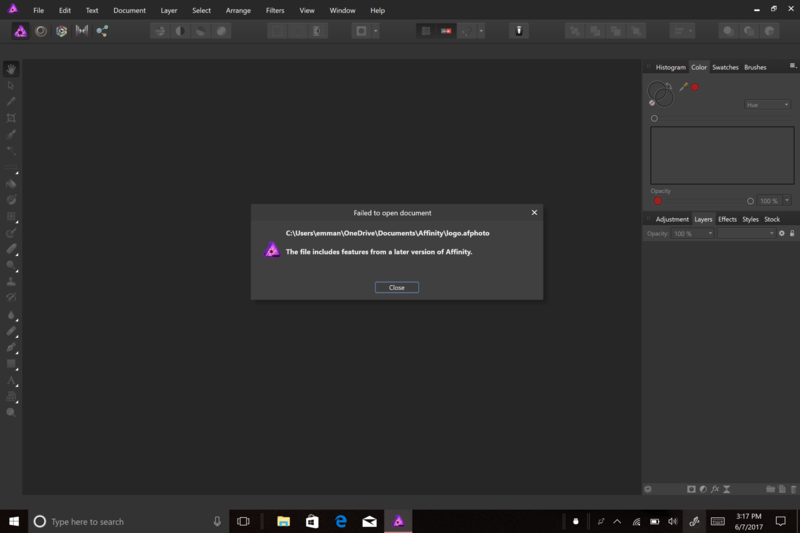 I created a file on Affinity Photo on the iPad Pro 9.7 and save it to the cloud to then finish it on the PC but couldn't open the file. This was the error message. The iPad version is currently at 1.6.1 and the desktop version is at 1.5.2. If you've used certain features (can't remember which off hand unfortunately) then they are not backwards compatible with older versions - this is why you're seeing that message. With that said you can download the desktop 1.6 beta which will allow your files to be opened. This can be done from the link below. I will say however is to please read Andy's post carefully! Thanks for the info... I export it as PSD and work it that way, the only thing was that my text was rasterized but maybe was my export settings.